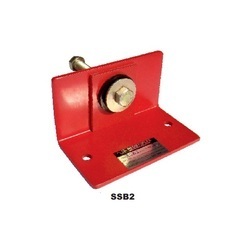 Pioneers in the industry, we offer seismic snubber from India. All directional Seismic Snubber consists of interlocking steel members restrained by a one piece molded neoprene bushing. Bushing shall be replaceable. A minimum air gap of 3mm incorporated in the snubber design in all directions before contact is made between the rigid and resilient surface. Snubber end caps are removable to allow inspection of internal clearances. Neoprene bushings shall be rotated to insure no short circuits exist before systems are activated.